The Davyhurst Project is located approximately 120 km north west of Kalgoorlie within the North Eastern Goldfields of Western Australia. The this large scale project comprises 112 mineral tenements totalling approximately 1,336 square kilometres which provides almost continuous coverage of approximately 200 strike kilometres of greenstone sequences prospective for gold as well as sulphide nickel and base metal mineralisation. The Company is focused on unlocking significant value from the company’s strategic and prospective landholding. To achieve this, the Company will target resource development activities at five advanced projects, namely Riverina, Waihi, Siberia, Callion and Golden Eagle. This work aims to deliver a robust Definitive Feasibility Study to underpin the future development of Davyhurst. The project has a 1.2 Mtpa conventional CIP processing facility with significant associated infrastructure, including and extensive road network, 160 man camp, administration & workshops buildings and a large bore field. The tenement package is accessed from Kalgoorlie by a series of well formed, unsealed shire roads and haulage roads. Airstrips are located at Davyhurst (Callion) and Mt Ida (Bottle Creek). Gold was discovered in the district in the 1890’s by prospectors following greenstone belts northward from Coolgardie. Within the project area mining towns were established at Callion, Davyhurst, Siberia, Ularring, Mulline, Copperfield and Mt Ida. Between 1890 and 1950 numerous small to medium scale underground mining operations were established within the project area with cumulative production of approximately 600,000 ounces of gold. Modern exploration and mining in the district commenced in the mid-1980s. Since that time a large number of companies have been involved or had operations in the area covered by the current project area. Consolidation of the fractured tenement holding was undertaken by Eastern Goldfields predecessor Monarch Gold Mining Ltd between 2002 and 2006. Since this strategic tenement consolidation there has been no large scale coherent exploration undertaken on the project. This has provided the company with a unique opportunity to define the critical mass needed to create a sustainable mining operation. 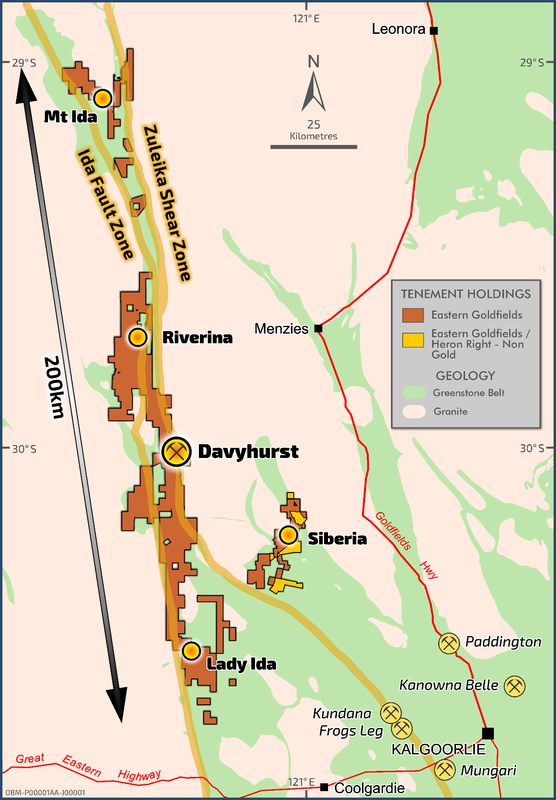 The Davyhurst – Mt Ida project area is located on a western branch of the Norseman Wiluna Greenstone Belt, The project straddles the boundary between the Kalgoorlie Terrane of the Eastern Goldfields Province and the Barlee Domain of the Southern Cross Province, which is defined by the crustal scale Ida Lineament. The project also includes portions of the Zuleika Shear which separates the Coolgardie and Ora Banda Domains within Kalgoorlie Terrane. The Barlee Domain comprises a sequence of banded iron formation (BIF), shale, chert, and basalt poorly outcropping to the west against the basement granite. This lower unit is overlain by a thick monotonous sequence of tholeiitic basalt to the east to the Ida Lineament. The Ida Lineament is a poorly defend structure, but is usually interpreted to be the contact of the western most ultramafic unit as defined by aeromagnetic’s. East of the Ida Lineament, greenstones of the Coolgardie and Ora Banda Domains and consists of a sedimentary and felsic volcanoclastic rocks to west with mafic to ultramafic volcanic’s and felsic to the east. The project is bounded by basement granite and gneiss terrane. Internal to the greenstone belt there are a number of granite intrusives of various ages. The most dominant granite is the Ularring Granite located midway between the Davyhurst and Riverina area. Gold mineralisation is the principal target within the project and occurs across all geological domains within the project. Bedrock gold mineralisation within the project is structurally controlled, generally associated with mafic and Hi MgO volcanics and intrusives. - Lode style silica biotite pyrite altered shear zones with minor quartz veining which are typically developed down the eastern side of the project area. Recent discovery of gold mineralisation adjacent to the mafic granite contact on the north west corner of the Ularring Granite at the Giles Deposit highlights the potential of further discoveries to be made on the margins of or within granite bodies within the project area. 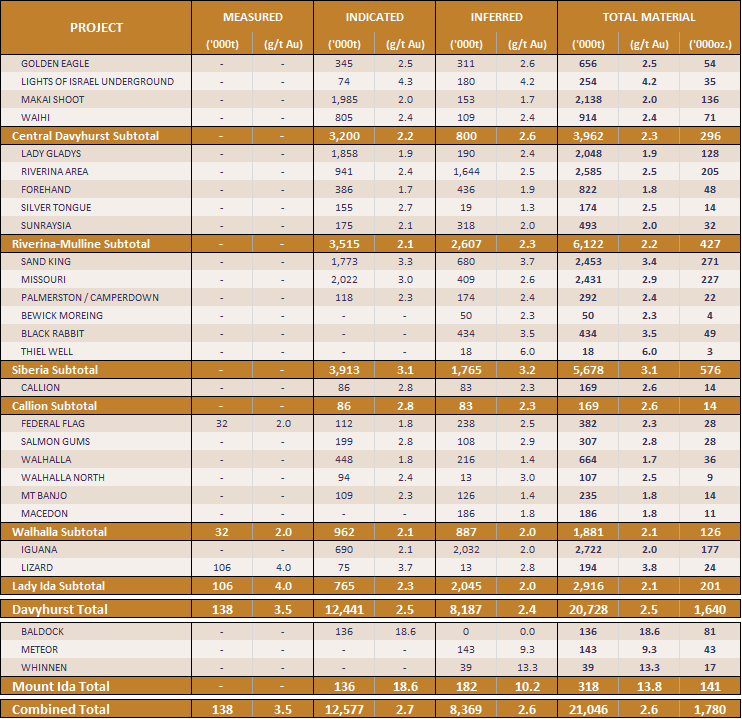 All Resources listed above with the exception of the Missouri and Sand King Resources were prepared and first disclosed under the JORC Code 2004 (refer to ASX release “Swan Gold Prospectus”, 13/2/2013). It has not been updated since to comply with JORC Code 2012 on the basis that the information has not materially changed since it was last reported. The Missouri and Sand King Mineral Resources has been updated and complies with all relevant aspects of the JORC code 2012, and initially released to the market on 15 December 2016 (Missouri) 3 January 2017 (Sand King). The First Hit and Lady Bountiful Resources are no longer held by the Company and as such have been omitted from the above table. The above table contains rounding errors.